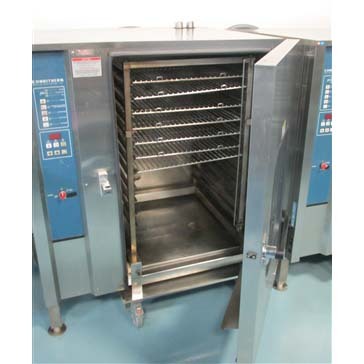 Alto Shaam Combitherm Combi Oven provides increased food quality and expands menu options while increasing production efficiency and speed by as much as 70-percent compared to conventional cooking methods. 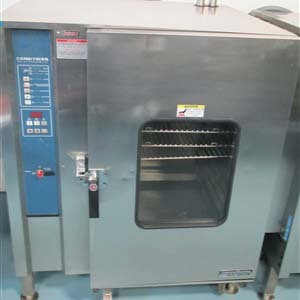 Cook by internal product temperature or time with temperature variable steam, convection heat, or a combination of both to roast, steam, bake, or oven-fry in a single piece of equipment. EcoSmart technology reduces energy cost by using less electricity and water during both normal operation and the cleaning function. Gold-n-Brown feature provides operator with the ability to add additional product color. 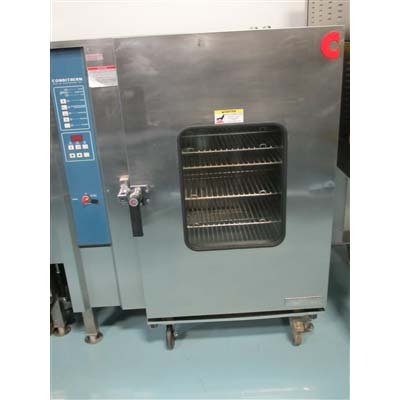 AutoClean feature simplifies the cleaning process to a single oven function. Standard and Deluxe control offers a 2-speed fan, cool-down feature, additional moisture injection, Delta-T cooking multiple language display, and other control features. Enhanced safety feature includes automatic steam venting immediately before cooking time expires.